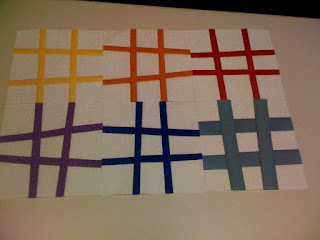 I had a lot of organizing to do to get these blocks prepared – now that I am set up I’m planning on making nine blocks this month – but right now I’m submitting the first six completed. I’m pleased with how they look, and even more happy that my husband and son both got a little involved with helping me get things set up, picking out the bright materials, and getting me a 8.5 inch block ruler that made it very easy to get to the final size. I’m glad to have found this block lotto – I think this is just the sort of thing that will get me started again with quilting! Thank you Sophie and all of you! Hope these will get on the official list for the month! I've added your 6 blocks to the list (I'll update the number when you post your next 3). Our new total-so-far for January is 219 blocks. If 8 more blocks are entered in the next week, we'll have FIVE winners. The first four names picked with win a set of 48 blocks and the fifth person will receive 35 blocks.